Summer League is just around the corner and Razzball will have you covered for it all. Be sure to stay tuned over the upcoming weeks for those updates as well as Part 2 of my Rookie Rankings, after a much needed break to London this weekend. 1 Luka Doncic Mavericks PG/SG/SF/PF Positional flexibility. Great fit in Dallas and already possesses elite passing, basketball IQ, and court vision. High floor and the ceiling is under rated too. 2 Trae Young Hawks PG Playing time won’t be a factor. With elite three-point shooting, under rated passing ability, and penchant for thievery (1.7 spg in college), Young provides both a high floor and ceiling for fantasy. Atlanta believes in him. So should your fantasy team. 3 DeAndre Ayton Suns C Can’t deny the physical gifts, but the Bahamian still has a lot to learn for the next level. PHX fans got their guy and the upside is immense. 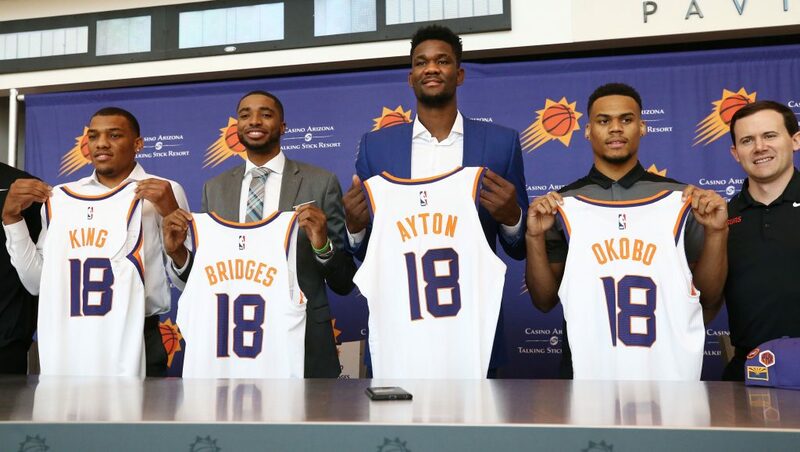 The Suns are gonna be fun to watch this year. 4 Jaren Jackson Jr Grizzlies PF/C I really like the landing spot. Jackson has a chance to learn from the versatile Marc Gasol and, with elite shot blocking ability and three-point range, has huge upside in the long term. Might take more time than some of the other premium prospects, though, so be patient. 5 Marvin Bagley III Kings PF/C ACC player of the year. I like Bagley, but have him at 5 because of concerns about his poor free throw shooting. Possesses the skill for elite FG%, boards, and points, and is in a plush landing spot for fantasy. Increased value for a punt FT% team. 6 Michael Porter Jr Nuggets PF Talent is talent, and despite falling on draft day over the medicals, I am still a big believer. Embiid sat out a year and now is an elite player. Can you afford to bet against MPJ even if you have to wait? 8 Miles Bridges Hornets SF/PF Chance to be an excellent two-way player. Excited to see the Miles and Malik era once Kemba has moved on. Whether he plays the 3 or 4 is in question, but Miles will do enough things well in fantasy to warrant this ranking. 9 Mo Bamba Magic C Call me the low guy on Mo Bamba, but I don’t believe in the new shot mechanics. Don’t like the landing spot with Clifford and the roster composition. Can’t ignore the physical size, but if the offensive game doesn’t develop, then it’s gonna be defense as your primary asset for fantasy. There are more talented shot blockers in this draft. I am hoping that I’m wrong with this ranking. 10 Wendell Carter Jr Bulls C Good fit with the Bulls. I’m intrigued by his skills and landing spot. The Bulls need the talent infusion. All-around skill set, but is a 54% field goal percentage in college really that good? Should be a safe high floor guy for your fantasy team. 11 Kevin Knox Knicks PF Love the size, athleticism, and landing spot. Struggled at times in college on a very young Kentucky team, but feel his game will progress very well at the next level. One of the youngest players in this years class. Porzingis got booed on draft night by Knicks fans and we know how that turned out. So did Knox. Read into that how you will. 12 Elie Okobo Suns PG No secret I’ve been on the Elie Okobo bandwagon for a long time. Having watched a lot of French basketball this season, I have been super impressed with his offensive skills, especially as a shooter from range and his ability to navigate PnR action. Great landing spot. The future is bright. 13 Lonnie Walker IV Spurs SG Another great landing spot. What Lonnie lacks in IQ should be well accommodated by the veterans and Popovich. Might not be a star, but Lonnie should have a bright future on an aging Spurs team. 14 Shai Gilgeous-Alexander Clippers PG Another product of the young 2017/18 Kentucky team that burst onto the scene and became arguably their best player. A PG with good size, Shai has the opportunity to develop on a Clippers team heading towards a new era. 15 Mikal Bridges Suns SG/SF Look, I like Mikal Bridges as a player, but from a fantasy perspective I don’t see a great deal of upside. His rank is helped by his move to Phoenix, where he will see significant action immediately, but it’s hard to see the three year Nova product being a focal point of the offense. 16 Kevin Huerter Hawks SG Hawks needed firepower and got it on draft night with Young, Huerter, and Spellman. Huerter will be given an opportunity to develop his skills and hold his primary value as a sharp shooter from range. 17 Mitchell Robinson Knicks C When all is said and done, this ranking could be too high or too low. There is no arguing the talents of Mitchell Robinson, who along with Jaren Jackson Jr could be the best shot blockers in this class. Looks like a DeAndre Jordan clone to me, which has value for your defensive stats, but it’s all about where his body and mental state will be after sitting out the entire season and then withdrawing from the combine. 18 Dzanan Musa Nets SF/PF Great landing spot for the Moose, who will have the opportunity to showcase his offensive talents right away. Will offer firepower and confidence that the Nets rotation needs and should project as a better fantasy than real life player. Displays an uncanny knack for getting to the line. Probably not a future star, but the Croatian has the skills to get red hot. 19 Omari Spellman Hawks PF/C At 6′ 9″ 260 pounds, there are questions about his body. Outside of that, Spellman has three-point range (43% in college), provides good energy, and aggression on the boards. He has a real chance to develop into a very solid fantasy player at minimal cost. 20 Zhaire Smith 76ers SG Freak athlete who was confirmed as Brett Brown’s 1B to Mikal Bridges 1A. Much more raw than Mikal and more of a risk, but potentially higher upside if the offensive game can develop. Not the greatest landing spot, but will Zhaire be there long enough for that to matter, as the team is bouncing around ideas of adding more stars to the roster. 21 Isaac Bonga 76ers SG/SF/PF A real project and ranked more on upside than opportunity. Showcased his high upside in Germany playing for Frankfurt, where he demonstrated an excellent ability to play PF despite the small frame at 6′ 9.” Does a lot of things really well, but needs the physique to catch up with the technique. 22 Gary Trent Jr Trailblazers SG Drafted by the Kings and then traded to the Trailblazers. With the horrid cap situation in Portland, are the Blazers looking to move on from McCollum? GTJ is a sharp shooter who can score in bunches, and when all is said and done, could make teams regret passing on him. 23 Donte DiVincenzo Bucks SG Felt like a safe pick for the Bucks and, although he tested well at the Combine, I struggle to get excited about the upside from the national championship MVP. 24 Troy Brown Wizards PG/SG Another young player from the class, Brown is a combo guard who has good size and skill. I didn’t care for the landing spot, but the upside keeps him in the top 30. Brown has the raw size and skill to make me regret ranking him this low. 25 Aaron Holiday Pacers PG Indiana Pacers, where PG’s go to die. I like the abilities but hate the landing spot. Hopefully the youngest of the Holiday brothers can reverse the trend. 26 Chandler Hutchison Bulls SF The rumors that the Bulls promised Hutchison that they would draft him came to fruition. He will get opportunity out of the gate, but lacks some of the upside that others in the class offer. Underrated as a distributor. Has good wingspan at 7′ 1.” Does a little of everything well, but unlikely to dazzle. 27 Shake Milton 76ers PG Combo guard with great size who is ready to contribute right away as a 3 & D guy. I was surprised how far he fell in the draft, but didn’t land in an ideal spot. Could he be on the move like Bonga and Zhaire? 28 Jerome Robinson Clippers SG It’s no secret I am lower on Robinson than most. I primarily see him as an off-the-ball shooter who is a big liability on the defensive end. The Clippers obviously see something in him and he does have opportunity long term. 29 Grayson Allen Jazz SG Probably the most disliked man in the draft, Allen ended up in a good situation in Utah, where his three-point shooting will no doubt get him court time. Surprised at the Combine, so maybe there will be more to his game than I give him credit for. The kid clearly wants to win, and that passion can’t be ignored. 30 Anfernee Simons Trailblazers SG I wish I had more opportunity to watch Anfernee Simons live, rather than YouTube videos, but it is what it is. The Blazers invested a mid-first rounder on the Florida native and everything that I have seen (which admittedly isn’t as much as other prospects) suggests an offensive minded combo guard. Waaaaaaait isn’t Ben Simmons going to be #1???? The Sixers picked Bonga for the Lakers. Their other player from this draft class outside Smith and Milton was Landry Shamet. Im a little bit concerned about Bagley with his blocks. Pleasure to hear from you Saints as always. I actually don’t have the sane concerns about block numbers as most in the NBA. Bagley has great athleticism that will hell transition to the defensive side of the NBA game. It’s actually his defensive footwork that finer s me more than his ability to put up defensive stats. Duke D was a mess last year and switched to zone, plus the CARA rule really stops players beibg able to develop freshman as much defensively with limited actual coaching time.